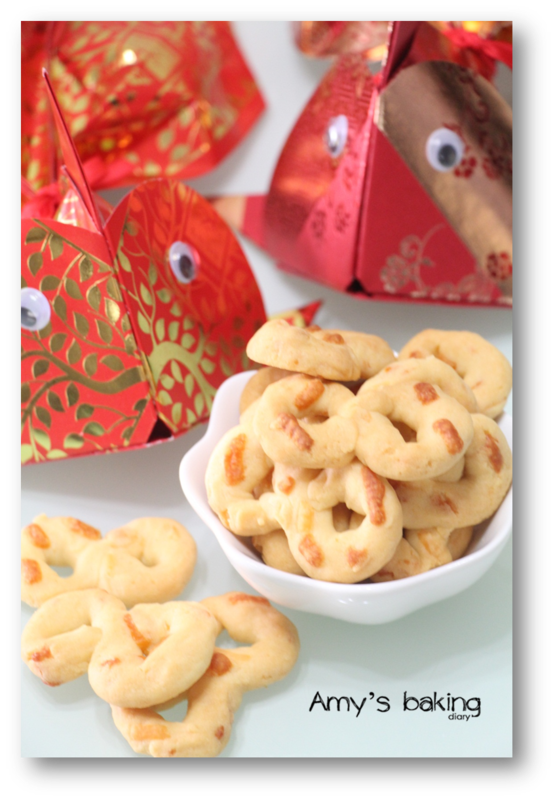 This is a wonderful and irresistible savoury biscuits which I have baked for CNY. It’s delicious and easy to make. It’s not the type of cookies that will melt in the mouth. These biscuits are crunchy and tasty. (1)Beat butter and sugar until fluffy, add in egg white, mix well. 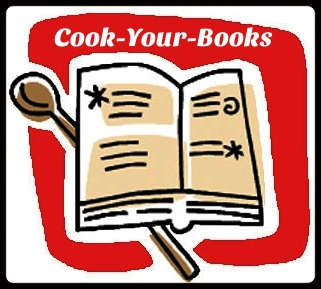 (2)Add in shifted flour, baking powder and the rest of ingredients, knead to form a dough. Refrigerated for 30 minutes. (3)Divide dough into 10g each, roll to long strips, about 20cm and arbitrarily formed a bow. (4)Dip on grated cheese, place onto baking tray. (5)Bake in preheated oven at 170°C for 15-20 minutes or until golden in colour. I’m baking along with the rest of my baking friends. 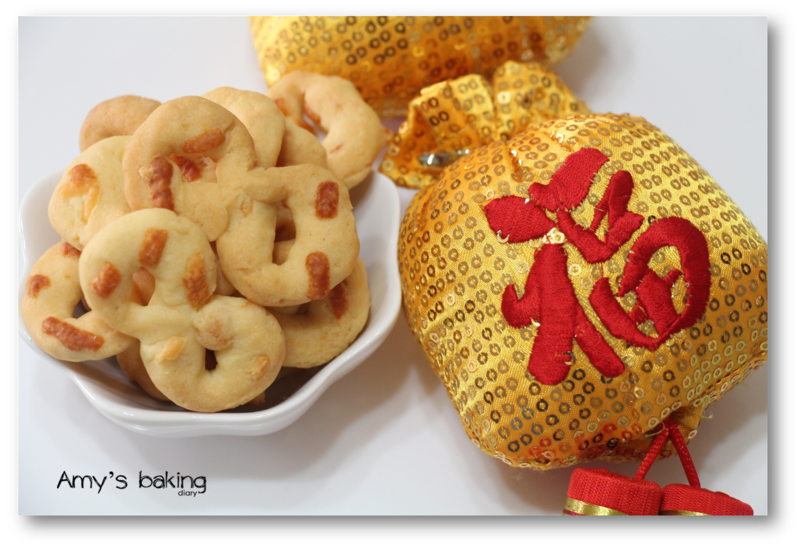 For this month theme, we are baking Chinese New Year cookies. 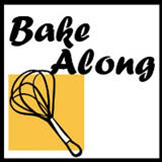 Bake-Along is organised by 3 beautiful ladies from Bake For Happy Kids, Kitchen Flavours and Frozen Wings. 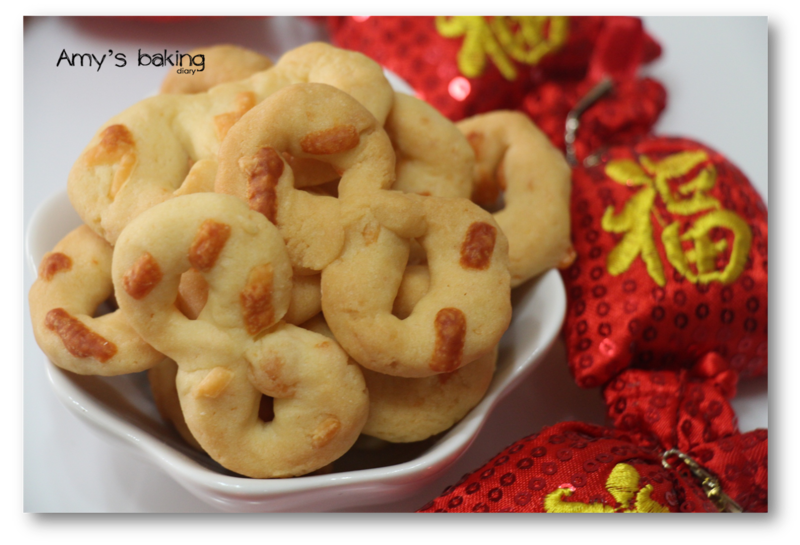 Click on the any of their link and you can find variety of CNY cookies that you can bake for this Lunar New Year. Alice from I Love. I Cook. I Bake. Did you win any 4D after baking and eating these cookies??? I wish this year is a year of 发 发 发 for you and me too!!!! Yours cookies look so good! 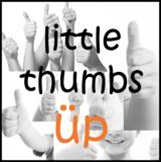 Thks for linking this up at LTU cheese! So "ong" ah your biscuits! Hope you "fatt fatt fatt" a lot after these cookies. I like your folded fishes. I love cheese and these cookies would be great with either coffee or tea! Thanks for linking for all the events! hehe..this is so cute that you associate 发发发 with these cheesy biscuits! i also hope our body shape will be as nice as the figure 8 despite all the eating ...! Hello there! I love the shape of your cookies!